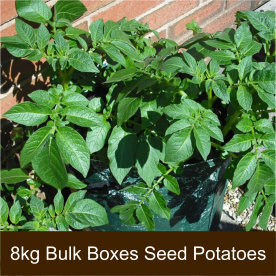 Seed potatoes are easy to grow, they tolerate most soils and are available to order for most of the early part of the growing year. There’s nothing like the thrill of pulling fresh potatoes out of your very own soil. All our Potato Seeds are sourced from the UK's 2 top seed merchants, Nearly all is Scottish grown, with selected varieties being grown in Ireland. We hold all seed potatoes in our coldstore until needed for despatch, this keeps the tubers in top quality condition and ready to burst into growth after being delivered to you. No longer do you have to buy soft potatoes with long chits that have been stored in warm shop conditions. Growing your own potatoes is incredibly rewarding, but to grow them successfully you’ll need good quality seed potatoes rather than seeds produced by the flowers. 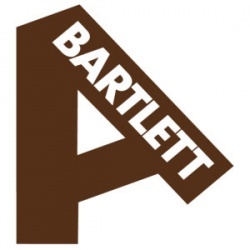 Seed potatoes are disease–free potatoes that have been selected, tested, and kept in a cool dark place until needed for planting for the next years crop. 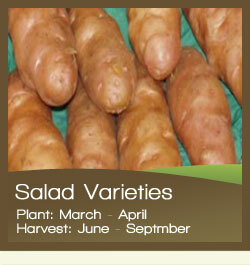 There are many different varieties so you can grow your own throughout the summer seasons. The first earlies which are harvested in May onwards are particularly popular as are December-ready varieties that are planted in July, but no matter what type you prefer they’re all grown in roughly the same way. What Makes a Good Seed Potato? 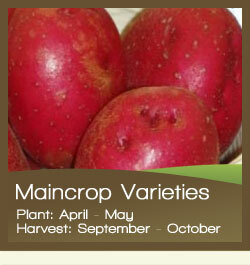 A top quality seed potato will look firm and feel springy rather than soft and soggy. 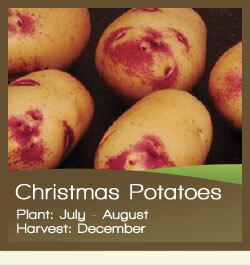 You’ll find your potatoes will grow faster if they have started chitting before you plant them. Some people like to leave all the chits as this can lead to a bigger crop of smaller potatoes, but if you prefer to harvest a smaller crop of larger spuds for Jacket Potatoes, pick off all but one or two of the chits before planting. You don’t have to chit your potatoes but it gives a good head start and you’ll get edible potatoes sooner, when prices are high in the shops. 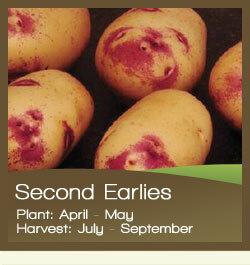 It’s best to order your seed potatoes a few weeks before you want to plant them. Placing seed potatoes on a tray or an old egg box on the windowsill with the eyes facing upwards is a good way to encourage chitting. 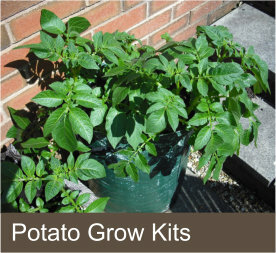 Read the instructions on when to plant your seed potatoes as it will differ depending on whether you have first earlies, second earlies or maincrop varieties. 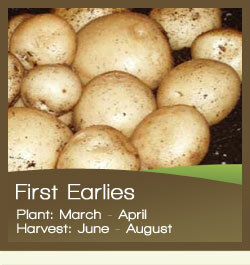 First earlies grow the quickest and are usually ready within ten weeks, second earlies take around 13 or so weeks and maincrop potatoes take 15-18 weeks. Warm weather with sufficient rain will speed things up and you should see green sprouts poking through the soil within three to four weeks of planting. There are two ways to grow your seed potatoes. Dig over a patch of ground and remove all the stone and roots, if you add some well-rotted manure this will give your seed potatoes a boost. Dig to a depth of ten centimetres and place one potato in with the chit facing up and plant them at least twelve inches apart. As the greenery grows keep covering them entirely, this is called ‘earthing up’. You’ll create a mound of earth like a mole hill which keeps growth safe from frosts. 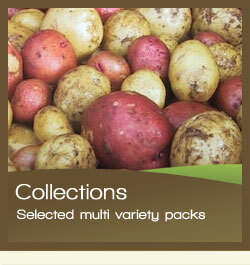 You can also grow all types of seed potatoes in a bag or container. This method means you can use compost which is stone-free and simply upturn the pot at harvest time. Plant them as above and keep well-watered. First and second earlies are ready to harvest around 10 - 14 days after finishing flowering, but its best to wait for the plants to die down on maincrop types as this gives them time to set their skins. Dig out potatoes as you want them or store them in a dry dark place inside a hessian sack.